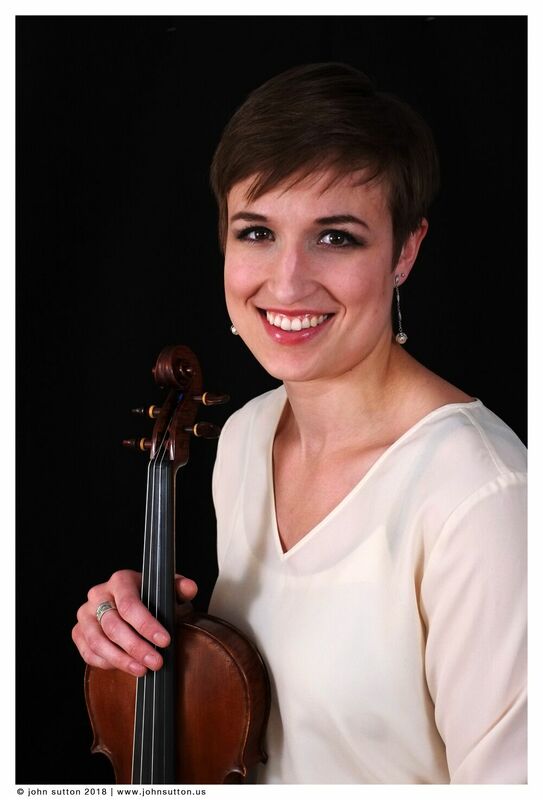 A native of Vermont, violinist Deanna Baasch began studying the violin at the age of eight. By the time she was 17, Deanna had performed both violin and flute in more than 30 countries including China, Zimbabwe, South Africa, Brazil, Argentina, and throughout Europe as a member of the New England Youth Ensemble, the Southern Maine Ensemble, and the Baasch Family Ensemble. She also toured extensively with the New England Symphonic Ensemble under the direction of John Rutter, both at Carnegie Hall and internationally. During this time she was a student of Joana Genova. With a Bachelor’s degree in Violin Performance and a Master’s in Social Work from Southern Adventist University in Tennessee, she studied under the direction of Mark Reneau and served as concertmaster of Southern Adventist University’s Symphony Orchestra. Since moving back to Vermont, Deanna has been freelancing as a violinist, performing regularly with the Manchester Festival Orchestra, the Berkshire Symphony Orchestras and the Taconic Chamber Players. Since 2013, Deanna has taught violin and viola in Manchester, VT. In addition to her musical career, Deanna is also a mental health therapist and restorative yoga teacher. A native of Bulgaria, Vesela received her bachelor's degree in Viola and Music Pedagogy from the Academy of Music, Dance and Fine Arts in Plovdiv. As a member of the Plovdiv Chamber Orchestra, Plovdiv Symphony Orchestra, she has toured throughout Europe. Vesela settled in Manchester in 2001. She created the student string program at the Mettawee Community School and teaches piano privately, in addition to violin and viola. Bulgarian violinist Joana Genova is Visiting Assistant Professor of Violin and Director of Chamber Music Initiatives at University of Indianapolis and Artistic Director of Taconic Music in Manchester (VT), Joana Genova began playing violin at the age of six, made her solo debut at the age of twelve with the Plovdiv Chamber Orchestra, and is a prizewinner of the National Competition in Bulgaria. She received her Bachelor of Music at the Conservatory of Amsterdam and her Master’s degree in chamber music at the Rotterdam Conservatory in the Netherlands. Since 2000, Joana has lived in the U.S., maintaining an active career as a chamber musician, orchestral player, teacher and soloist. She was Artist Associate at Williams College, principal second violin of the Berkshire Symphony Orchestra, concertmaster of the Manchester Festival Orchestra, member of the Brooklyn Philharmonic and has performed as guest soloist with Adelphi Chamber Orchestra, Harlem Chamber Players, Metropolitan, Rockaway, Danbury and Berkshire Symphonies, Manchester Festival Orchestra and Yonkers Philharmonic. Joana is a frequent guest at various festivals and concert series and is on the faculty of Taconic Music’s summer Chamber Music Intensive and InterHarmony Music Festival in Italy. Violist and conductor Ariel Rudiakov is co-founder and Artistic Director of Taconic Music in Manchester, VT, Music Director and conductor of Danbury Symphony Orchestra, CT and Adjunct Faculty at the University of Indianapolis. Born in Indianapolis, IN and raised in Riverdale, NYC, Ariel comes from a musical family going back three generations. He holds viola performance degrees from SUNY Purchase (BM) and the University of Illinois at Champaign-Urbana (MM). Former member of the New York Piano Quartet and Equinox String Quartet, founding member and president of SONYC (String Orchestra of New York City), Ariel was Artistic Director of the Manchester Music Festival (VT) from 2000 to 2016. Resident and guest conducting positions have included the Adelphi Chamber Orchestra, Metropolitan Symphony, Bergen, and Yonkers Philharmonics, Antara Ensemble, Manchester Chamber Orchestra, Harlem Chamber Players, Sage City Symphony and recording sessions with Dance Theater of Harlem. Jared Shapiro holds a BA in Music and Natural Science and an MFA in Cello and Composition from Bennington College. He studied composition with Henry Brant, Vivian Fine, Allen Shawn, and Louis Calabro and improvisation with Milford Graves. His interest in world music has led to ongoing collaborations and performances with musicians from diverse international music cultures. In 2014, Jared commissioned Norwegian composer Bjørn Bolstad Skjelbred to write a duo for cello and bayan (Russian button accordion), sponsored by the Norwegian Composer’s Fund. He has been playing in the eclectic trio Natural History since 1973. He is an active freelancer, an Adjunct at Green Mountain College and Castleton University and coaches for the Manchester and the Mountains Chamber Music Workshop. Jared was on the faculty of the Manchester Music Festival’s Michael Rudiakov Music Academy for 13 years and currently teaches for Taconic Music's Strings for Kids program as well as privately in East Dorset and Manchester, Vermont. Cellist Karen Svirsky received a Master of Music degree in performance from Manhattan School of Music in New York City, after receiving a Bachelor of Music degree from Temple University in Philadelphia. She began studying cello in public school and Philadelphia’s renowned Settlement Music School. Her cello teachers include David Wells, Raya Garbousova and David Guggenheim, and chamber music coaches include Edgar Ortenberg, Lillian Fuchs, and Sascha Jacobsen among others. Karen has performed in numerous orchestras, chamber orchestras, and chamber ensembles including the Hudson Valley Philharmonic, New Jersey State Opera orchestra, Adelphi Chamber Orchestra, and Essex Chamber Players. She played continuo cello on a Musical Heritage Society recording of the J.C. Bach Complete Flute Sonatas. Her teaching experience includes public school music teaching in Philadelphia and the Northern Valley Regional High School District in northeastern New Jersey; college-level instruction at Jersey City State College and William Paterson University; and adjunct instructor for David Wells. She has taught private students in southern Westchester, Rutland, Vermont, the Upper Valley region of Vermont and New Hampshire, and Prague, Czech Republic. Born and raised in Rhode Island, violinist Cami Sylvia enjoys a varied career as soloist, chamber musician, and pedagogue. She received a Bachelor of Music Performance degree with a minor in Rhetoric and Writing from Rhode Island College. Additionally, Cami earned a Master of Music degree and an Artist Diploma from SUNY Purchase Conservatory, where she studied on scholarship under the tutelage of Deborah Buck. Since 2012, she has performed annually as a soloist with the Rhode Island College Chamber Orchestra. She will return to Purchase in 2019 as an alumna, to perform as their 2017 Concerto Competition winner. Cami, who made her Carnegie Hall debut in March 2018, has participated in numerous masterclasses, including for renowned artists Ani Kavafian, Kristin Lee, and Sean Lee of the Chamber Music Society of Lincoln Center; Emerson, Muir, Indianapolis, Shanghai, and Kronos quartets; and members of Kalichstein-Laredo-Robinson and Horszowski Trios. This past June, Cami joined Music on the Hill, a premiere chamber music festival in Rhode Island, as one if its youngest members. She has also attended Eastern and National Music Festivals, as well as Taconic Music’s Chamber Music Intensive, a four-week program in which she learned and performed four complete chamber works for the public. Cami most recently served on the string faculty at Larchmont Music Academy (NY). She joins the Strings for Kids faculty this fall. In addition to performing and teaching, Cami works full-time for Johnson String Instruments, headquartered in the Boston area. She performs on a violin by Vermont maker Douglas Cox.